To give the Chinese proverb in its entirety, ‘Keep a green tree in your heart and perhaps a singing bird will come’ – and to extend the metaphor (or revert it back on itself! 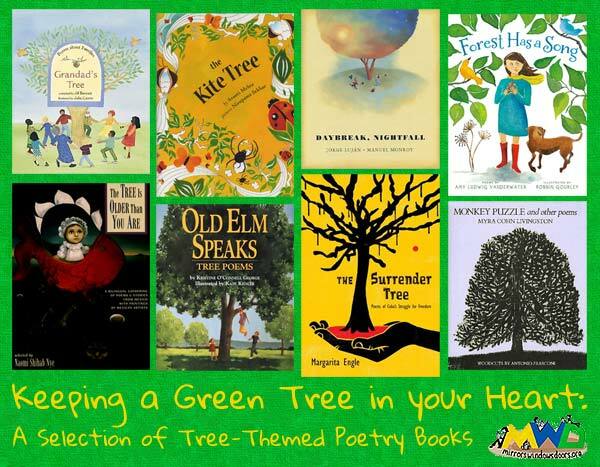 ), the selection of books I have brought together here all centre on trees to convey their different stories, through poetry; and each, in its own special way, sets the heart singing and the imagination soaring. 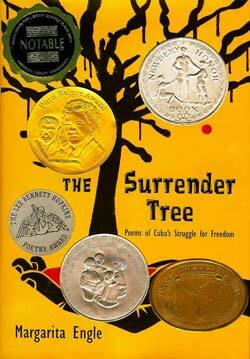 From the single-poem picture book The Kite Tree for young children through to the exquisitely honed novel in verse, Margarita Engle’s The Surrender Tree; from single-author collections through to thoughtfully compiled anthologies, there is something here for everyone. The atmospheric illustrations provide a perfect balance of reassurance in their depiction of the narrative with, at the same time, no hint of undermining the freedom to imagine. Each time ‘I walk up the hill to the tree at the top’, there is something new to discover and the tree, as it completes its cycle through the seasons, always offers something new. By the end, it’s not clear what is ‘real’ and what is filtered through the observer’s imagination. The lyrical repetition of the opening phrase emphasises the calm tinged with expectancy that each new visit brings, and the translucent, batik-like illustrations complement this beautifully with their soaring perspectives. Not being an expert on Indian trees, I’m not sure what the ‘kite tree’ is based on, but it’s certainly tropical, with its huge seed pods. I did find myself so thoroughly engrossed in this guide while trying to see if I could find it, so I’m sharing it with you here too! 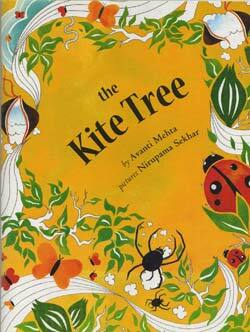 In the meantime, The Kite Tree is a lovely book for sharing with a child if you have a regular walk that takes in a tree – or for encouraging you to do so! 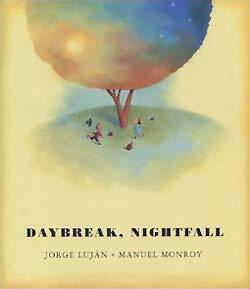 Read a review that does this book justice, on the Mulled Ink blog. Spanning the three wars for Independence from 1850-1899 in Cuba, Margarita Engle’s compelling free-verse narrative told in the different first-person voices of her protagonists weaves together real and imagined historical figures to open up a little known area of history, and leaves readers pondering the waste and sheer wickedness of greed, tyranny and hatred. The central figure is freed slave Rosa, a nurse with the freedom fighters who uses her knowledge of plants to heal the injured on both sides of each conflict. Other voices include Rosa’s perpetually worried husband Jose, who devotes his life to keeping Rosa and her secret hospitals hidden; vengeful slave-catcher Lieutenant Death; Spanish General Weyler; and, latterly, the young Silvia, who is determined to escape the concentration camp where she is interned and find the legendary Rosa to become a healer in her turn. The compactness of the poetry seems to reduce language to its exquisite essence, just like Rosa extracts the goodness from the plants she uses to heal. It also makes the history very accessible and takes readers straight to the human heart of the story. The tree of the title casts its suggestive shadow throughout the book but only towards the end do we learn its very real significance. Engle’s personal Author’s Note and factual Historical Note also make fascinating reading; and there are references and discussion questions for deeper engagement. This later edition has the bonus of being in both English and Spanish. This is an old book now sadly out of print but worth hunting down, both for the poems themselves and the beautiful wood-cut illustrations. 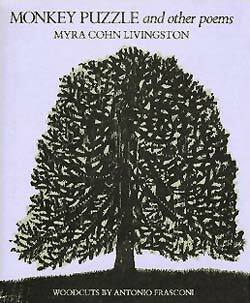 It’s a virtuoso collection about different kinds of tree using a variety of poetic forms and perspectives, including shape poems (and I think trees do beg to be expressed as a shape poem! ), haiku, cinquains, a villanelle and even a limerick. The opening poem, ‘Forest: An Invitation’, is a jubilant, possessive chant, encompassing the broad landscape of a forest – and the real surprise comes at the very end of the collection with ‘Rain Forest: Papua New Guinea’. 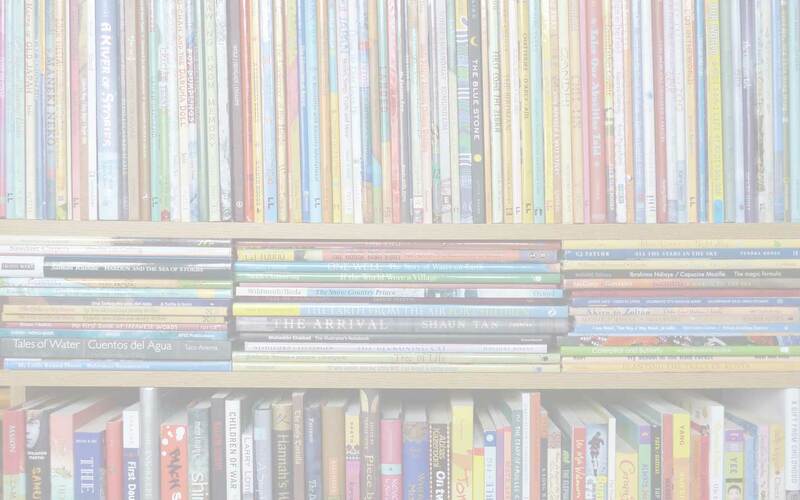 There are very few single-author collections that focus on trees (in fact, there aren’t many anthologies either, come to that), so it is also worth including two other children’s books here, though I did have to think long and hard about it. 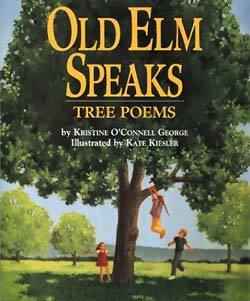 The poetry in both Old Elm Speaks: Tree Poems by Kristine O’Connell George, illustrated by Kate Kiesler (Clarion Books, 1998) and Forest Has a Song by Amy Ludwig VanDerwater, illustrated by Robbin Gourley (Clarion Books, 2013) is wonderful and speaks to everyone. I just wish that the illustrations, which portray the trees and their landscapes so beautifully, could be more inclusive and draw all young readers to them by reflecting cultural diversity in their depiction of the children that appear at various points throughout them both. 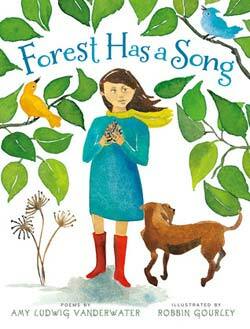 It is probably too much to expect of a book published in 1998 to reflect that kind of awareness, but Forest Has a Song has missed a trick. One could argue that poetry is an intensely personal genre and so responses to it, including the illustrator’s, will also be personal – but an awareness of the potential readership should be an acknowledged part of the brief, especially in a book that teachers are encouraged, and will certainly want, to use in their classrooms. However, as I said earlier, the poetry is a delight and is of universal appeal. In Old Elm Speaks, I love the shape poem ‘Tree’s Place’, with its reminder that ‘Tree stands its ground’ (it resonates particularly with me since my children have never let me forget the time I oh, so gently and catastrophically reversed the car into a tree..); and the title poem, saved up to the very end of the book, with its beautiful imagery and timeless wisdom. In Forest Has a Song, all the senses are set tingling on a journey of discovery into the forest. The poetry delves into the lives and gloriously imagined secrets of even the more generally overlooked forest denizens, such as moss and lichen. And I’m sure children (and adults!) never hear a woodpecker in quite the same way once they’ve heard about him typing his own poems. 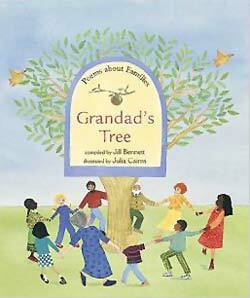 Two poems in this diverse anthology of family poems are expressly about trees – Christina Rossetti’s ‘Let’s Be Merry’, a cherry counting rhyme; and the ‘Grandad’s Tree’ of the book’s title, by Rowena Sommerville, about planting a tree as ‘our way of saying good-bye.’ The cultural and international scope of the collection is reflected in the illustrations, which also make much use of the metaphor of trees symbolising growth, roots and rootedness. There are happy and funny poems (such as ‘Sauce’ by Pauline Stewart); and sad and serious poems (‘My Father’ by Mary Ann Hoberman: ‘My father doesn’t live with us […] I miss him‘). 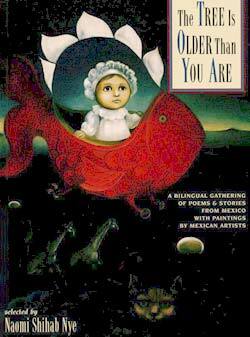 Poems explore intergenerational and sibling relationships (‘Granny Granny Please Comb my Hair’ by Grace Nichols; ‘Our Baby’ by Joan Poulson). There are poems about absence and loss, including Michael Rosen’s ‘Newcomers’ and Lindsay Macrae’s heart-wrenching ‘Always Remembering Eloise’, in the voice of a child mourning her sister who died before she was born; and poems that celebrate family – including Mary Ann Hoberman’s vibrant ‘ What is a Family?’, the first poem in this great anthology. In her vivid introduction, Naomi Shihab Nye describes , the ‘stories and songs and ripe images of Mexico’ as ‘a gift to our lives and hearts’: and she has certainly provided us with a collection to revel in here, both for the poetry and the evocative, dreamlike quality of the artwork. 'Branching Across the World: Trees in Multicultural Children's Literature, Amy Ludwig VanDerwater, Antonio Frasconi, Avanti Mehta, Barefoot Books, children's books about trees, Christina Rossetti, Clarion Books, Daybreak Nightfall, Forest Has a Song, Grace Nichols, Grandad's Tree: Poems About Families, Groundwood Books, Jesús Carlos Soto Morfín, Jill Bennett, Joan Poulson, John Oliver Simon, Jorge Luján, Julia Cairns, Kate Kiesler, Kristine O'Connell George, Lindsay MacRae, Manuel Monroy, Margaret K. McElderry Books, Margarita Engle, Mary Ann Hoberman, Mexican poetry, Michael Rosen, Monkey Puzzle and Other Poems, MWD article, Myra Cohn Livingston, Naomi Shihab Nye, Nirupama Sekhar, Old Elm Speaks: Tree Poems, Pancho Ernantes Ernantes, Pauline Stewart, poetry about trees, poetry anthologies, poetry for children, Rebecca Parfitt, Robbin Gourley, Rowena Sommerville, Simon & Schuster, Square Fish, The Kite Tree, The Surrender Tree, The Tree is Older than You Are, Tulika Books, verse novels. Bookmark.